average discharge 2 m3 / sec. Lake Rotomahana is located in the northern section of New Zealand’s North Island, less than one kilometer to the South of Lake Tarawera, and 20 kilometres (12 miles) southeast of the city of Rotorua. The lake was renowned worldwide for its gorgeous Pink and White Terraces, which were lost in 1886 because of the massive volcanic eruption of Mount Tarawera. The Pink and White Terraces were considered the world’s eighth wonder, and were the most famous tourist attraction during the 19th century in New Zealand. The eruption that destroyed them took place in the early hours of June 10th, 1886. Mount Tarawera erupted with astonishing force, and the explosions may have been heard as far as Christchurch, which is located 640 kilometers (400 miles) to the south-west, on the South Island. The eruption also killed 120 people, most of them Maoris (native New Zealanders), who were living in small nearby villages. The Pink and White terraces were incredibly beautiful, and they were the two biggest formations of silica sinter, a fine-grained quartz version, to have ever existed. One terrace was brilliant white in color, and the other was a light shade of pink. Both of them were geological marvels. After the eruption, the lake itself also disappeared, as its waters had been literally blasted into the air, combining with volcanic ash to form a muddy sludge up to 14 meters (46 feet) deep, which buried the surrounding countryside. However, in the following months, Lake Rotomahana grew back, as water from the surrounding streams began to fill the volcanic craters which blew the old lake apart. Now, the new lake covers an area which is 5 times greater than that of the original lake, and is also 4 times deeper. This also makes it the youngest natural lake in New Zealand. In 2011, scientists rediscovered the Pink and White Terraces which now rest on the lake bed, at a depth of 60 meters (200 feet). Nowadays, the lake has an area of 8 square kilometers (3.1 square miles), and a maximum depth of 112 meters (367 feet). Along with the now dormant volcano Mount Tarawera, it lies in the Okataina caldera, and is the deepest lake in the Rotorua district. The 700 meters (2,300 feet) of terrain that separate it from Lake Tarawera is mostly material from the eruption. Because Lake Rotomahana doesn’t have any natural outlet, its water level varies by about one meter, due to rainfall and evaporation. Lake Rotomahana is a wildlife refuge, and hunting of birds is prohibited. There is a healthy population of black swans that inhabit the lake. Efforts are being made in order to keep the largest island on the lake, Patitti Island, pest-free. The remoteness of the lake, its high scenic qualities, as well as the excellent fishing, make Lake Rotomahana very attractive to anglers. There are good numbers of rainbow trout, 1.5 kg in weight on average. Even today, there is a lot of thermal activity that can be observed around the lake. The area around now known as Waimangu Volcanic Rift Valley. This new volcanic caldera is home to one of the world’s largest hot springs. 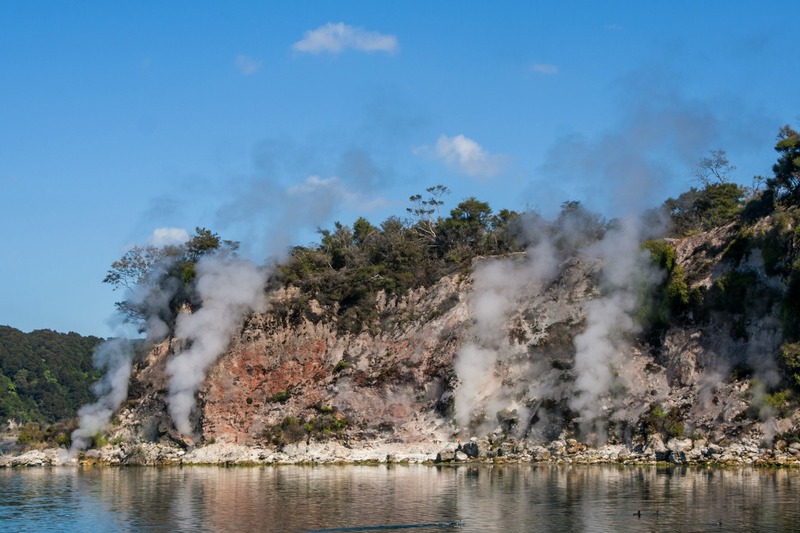 Visitors can relax on a cruise on the beautiful Lake Rotomahana, and see the rare geothermal activity on the shores of the lake.